A critical part of a dental care program for cats is an at-home examination of their teeth and gums. It is recommended that owners perform this routine on their cats for one to two minutes at least two to three times a month. It can help you identify potential problems early so you can schedule an appointment with your vet and keep your kitty as healthy as possible. You will be glad to know that it's relatively easy and most cats get used to it after the first few times. Many cat owners will laugh when you ask them about examining their cat's teeth. People believe their cats won't sit still for it or that their cat will just fight and scratch the entire time. It may not be the easiest task, but it is important and being prepared will make a world of difference. Gather all your supplies beforehand so you can direct all of your attention to your cat. Choose a time when your cat is naturally calm; gently waking it up from a nap is a good move. Ensure that you are calm as well because your cat will pick up on any negativity or nervousness you have about the exam. You will want to find a comfortable spot with good lighting. It may also be easier to have a partner or friend hold the cat's mouth open while you examine the oral cavity. To begin, smell your cat's breath. Cats don't naturally have either extremely pleasant or foul breath, so try to pay attention if it smells particularly off or not normal. An unpleasant odor may indicate an infection of the gums and/or bone. If dental problems can be eliminated, your vet can check for other possible causes. Start to talk quietly and softly to your cat to project calmness and soothe your cat. Continue this sweet talk as you go through the rest of the process. Then, gently tip the cat's head back slightly toward their backside. Next, using your thumb and index finger, spread the side of the cat's mouth open. Make sure you have a good flashlight or generally good lighting for the next few steps. 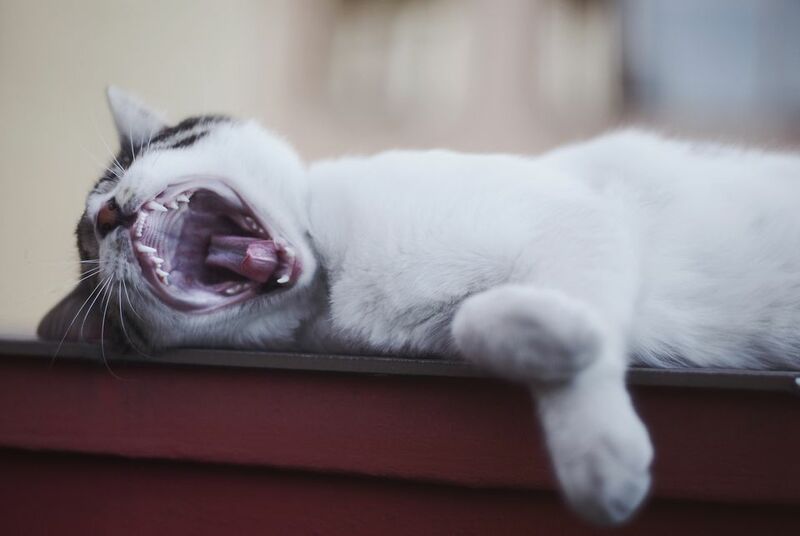 Beginning with one side of the mouth, examine your cat's back teeth. You'll want to look for yellowing (plaque) or darker material (tartar), as well as any cracked or broken teeth. Then, observe the color of the gums. They should be a healthy pink color, and not an angry red or a pale pink hue. Do the same tooth and gum exam on the front teeth and again on the other side of the mouth. As you work your way around, take mental note of any issues you notice. Write them down when you're done so you remember what to tell the vet about your observations. Before you let kitty go, look into the back of their throat for redness, especially a "cobblestone" appearance. This is a sign of stomatitis, a serious and painful condition usually found in older cats. An angled dental mirror can be of significant help with this task. When you're all done, be sure to reward your cat with a healthy treat. A dental chew would be an excellent and appropriate choice. After a few of these exams, your cat may even begin to look forward to this unique treat! If at any time the cat fights for attention, give it up and try another day. Trying to restrain a cat that is clearly annoyed with your poking and prodding will only make your next attempt that much more difficult. You want the dental exams to become a positive experience. Proper dental care will help your cat stay healthy and becomes more important as they age. Try introducing this procedure at as young an age as possible, but know that it's never too late to start. Once you and your cat are comfortable with the procedure, it's important to make it a regular practice. If you cannot do it a few times a month, aim for once a month. Finally, follow up with a veterinary exam once a year. If the cat has had previous dental problems, it is suggested to go for a check-up at least twice a year or more as needed.